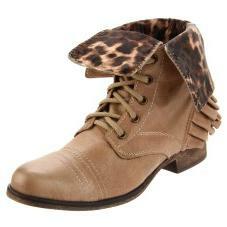 Strap into fun and funky fashion with this edgy ankle boot from Betsey Johnson. The Llola walks like a woman and talks like a man with weathered, yet flirty leather upper that features Leopard print lining and a pleated skirt over a stacked heel. Accented with double stitching, metal eyelets on the lace up and a short side zip for easy adjustments, the Llola definitely gets noticed.